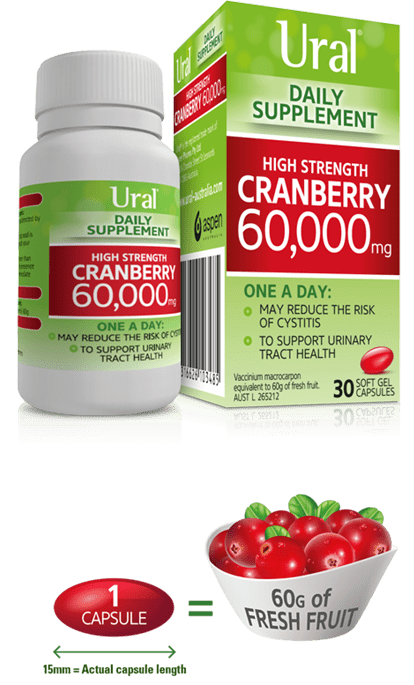 Ural High Strength Cranberry gel capsules – conveniently small, soft and easy to swallow – are designed to pack a big punch delivering a daily dose of 60,000 mg of Active Cranberry Extracts (ACE) – that’s equivalent to 60 g of fresh cranberries! Cranberries may help to reduce the risk of cystitis by discouraging harmful bacteria from attaching to the walls of your bladder and urethra – allowing future problems to be flushed away! Ural High Strength Cranberry capsules are formulated to provide a concentrated daily dose of cranberry. Cranberries reduce harmful bacteria from sticking to the urinary tract wall and may reduce the risk and frequency of cystitis. Cranberries help support a healthy urinary tract and their antioxidant properties may also help counteract free radical damage. 60,000 mg of blended Active Cranberry Extracts (ACE). For adults and children over 12 years. One capsule daily with food or as directed by a healthcare professional. 30 soft gel capsule packs from your local pharmacy. Did you know the Pilgrims first called the fruit “craneberry” because the stem and flower resembled the head and beak of a crane? Where can I find the Ural product range? Enter your postcode below to find the closest store to buy Ural. Stinging, painful cystitis symptoms? 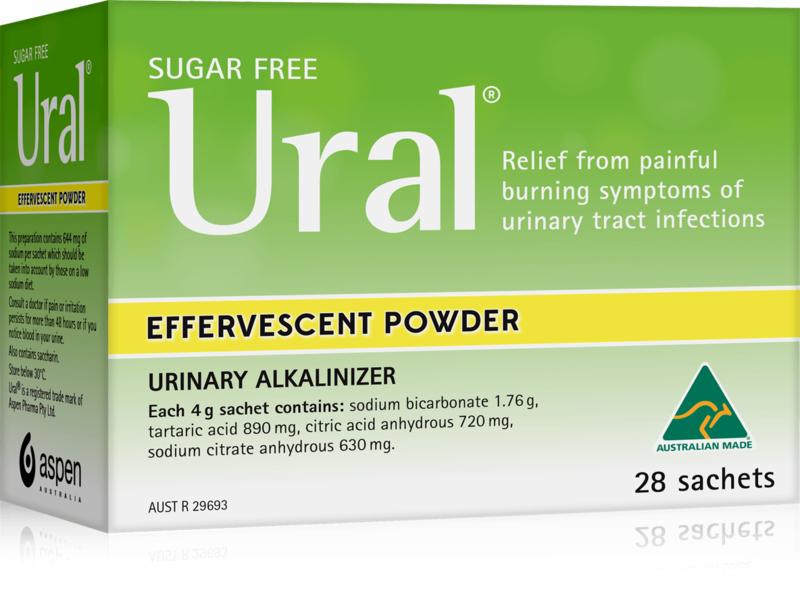 Ural Effervescent Powder is a urinary alkaliniser, which means it works by reducing the acidity of urine. This lessens the painful, stinging sensation so you can get on with life.